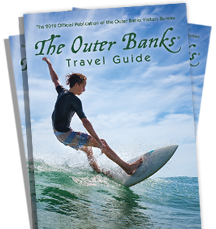 All site content is the property of the Outer Banks Visitors Bureau. Any use, reproduction or selling of any site content is strictly prohibited unless written permission has been granted by the Organization. You agree not to use any trademark of the Outer Banks Visitors Bureau, or any related graphic, as a link without prior written authorization from the Organization. If you do create a link to this website, you do so at your own risk and the Terms and Conditions of Use of this website apply to all use of this website via the link. Any deep-linking to or framing of this website may only be made with the prior written consent of the Organization. Please e-mail us at information@outerbanks.org for details or if you should have any questions. You must not misrepresent your relationship with the Organization or present false or misleading impressions about the Organization. Links may not be used in a manner that implies or suggests that the Organization approves or endorses you, your website or your goods and/or services (except as the Organization may have agreed separately with you in writing). The Organization shall have no responsibility or liability for any content appearing on your website. You agree to indemnify and defend the Outer Banks Visitors Bureau against all claims arising out of or based on your website. The Outer Banks Visitors Bureau reserves the right at any time and in its sole discretion to request that you remove all links or any particular link to this website from your website.